Exmouth’s own local hero, Victoria Cross* (VC) recipient Lieutenant Richard Sandford, is to be honoured with a special memorial flagstone, which will be laid during a VC dedication service at the Strand Gardens, Exmouth on Sunday 22 April 2018 – almost 100 years to the day that he carried out the mission that led to his award. 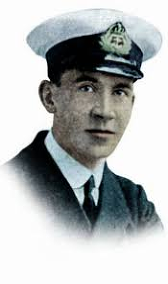 Lt Sandford, whose mother lived at 15 The Beacons, Exmouth, won the prestigious VC for his actions in command of HM Submarine C3 during the hazardous Zeebrugge Raid on April 22 and 23, 1918. At 26 years old, he was a Lieutenant commanding a submarine in the Royal Navy and was involved in a daring operation to scuttle three obsolete cruisers at the entrance to the Bruges Canal in an effort to prevent German submarines from accessing the U-boat pens. Two old submarines filled with explosives were to be used to blow up the viaduct connecting the Mole – a large solid structure serving as a pier, breakwater, or causeway - to the shore, while 200 Royal Marines were to be landed in an attempt to destroy German gun positions. Lt Sandford skilfully placed the HM Submarine C3 between the piles of the viaduct which connected the Mole with the shore, before laying his fuse and abandoning her. He decided not to use the gyro steering which would have enabled him and his crew to abandon the submarine at a safe distance, but preferred to make sure that his mission would be successful. He and his crew escaped in a skiff and rowed to the open sea still under intense fire before they were rescued. Sadly, just seven months later, Lt Sandford died of typhoid fever at Eston Hospital, North Yorkshire on November 23 1918, only twelve days after the signing of the Armistice, and the day after his last command, HMS G11, had been wrecked on rocks off Howick, Northumberland. His Victoria Cross is displayed at the Britannia Royal Naval College, Dartmouth. The laying of his memorial stone in Exmouth is part of a national First World War centenary commemoration campaign to honour Victoria Cross recipients from that war and members of his family – great nieces and great nephews – will be attending the ceremony. The service, which will be conducted by United States Navy (USN) Chaplain the Rev Mike Beasley, will begin at 10.55am on Sunday April 22 and an address will be given by East Devon District Council Chairman, Cllr Andrew Moulding. *The Victoria Cross is the highest and most prestigious award for gallantry in the face of the enemy, which can be awarded to British and Commonwealth forces. During the First World War just 628 crosses were awarded.